The conference will be held at the Waterloo campus of Wilfrid Laurier University. The city of Waterloo is easily reachable by air and ground transportation. 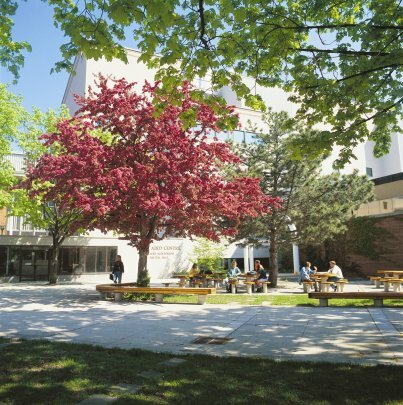 The campus is approximately a 25-minute drive away from Waterloo International Airport, 70 minutes from Toronto Pearson International Airport, and 80 minutes from John C. Munro Hamilton International Airport. From Waterloo International Airport, the campus is most easily reached (if not renting a car) using one of the local taxi services: United Taxi, City Cabs, or Waterloo Taxi; for which the approximate cost of taxi trip will be $40.00. From Toronto Pearson International Airport or John C. Munro Hamilton International Airport, the campus is most easily reached using Airways Transit. Airways Transit connects Toronto Pearson airport with the Waterloo area providing 24 hour door to door shared ride service. For Toronto Pearson airport transfers we have obtained a reduced conference fare of $58.00 per person, one way, tax included. To receive the reduced fare you must book in advance and identify yourself as an AMMCS delegate when making your reservation. By phone 24 hrs: 519 886 2121 - Identify yourself as an AMMCS delegate. 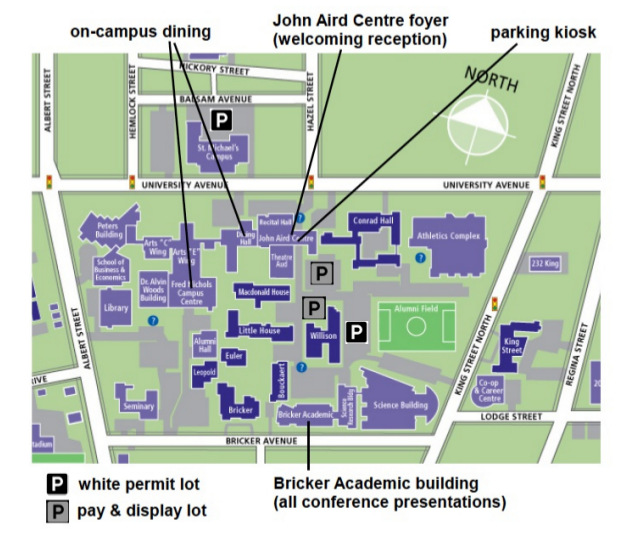 Reference directions to the Waterloo campus, campus maps, and parking lot map prior to departure. In addition to the aforementioned local taxi services, one may travel in Region of Waterloo using Grand River Transit. Wilfrid Laurier University is serviced by routes 7, 8, 12, 29, 200, and 201 on University Ave. W. and King St. N. A system map and route schedules are available on Grand River Transit's Web site. Intercity transit service is provided by GO Transit, VIA Rail Canada, Greyhound Canada, Coach Canada, and Aboutown. Local recommendations on various activities is provided below. More comprehensive recommendations may be found on the Web sites of Region of Waterloo, Explore Waterloo Region, City of Waterloo, City of Kitchener, and City of Cambridge. Furthermore, Great Canadian Holidays offers a number of tours that may be organized before or after the conference. In order to find out if you will require a visa to enter Canada, refer to Government of Canada's Find out if you need a visa to enter Canada as a visitor page. Nearby Canadian embassies and consulates may be found on the Foreign Affairs and International Trade Canada's Canadian Offices Abroad page. This documentation is to be sent to ammcs2013@wlu.ca with the subject line "Request for AMMCS-2013 visa invitation letter". The conference will be unable to process your request for a visa invitation letter if any of the documentation items are missing. 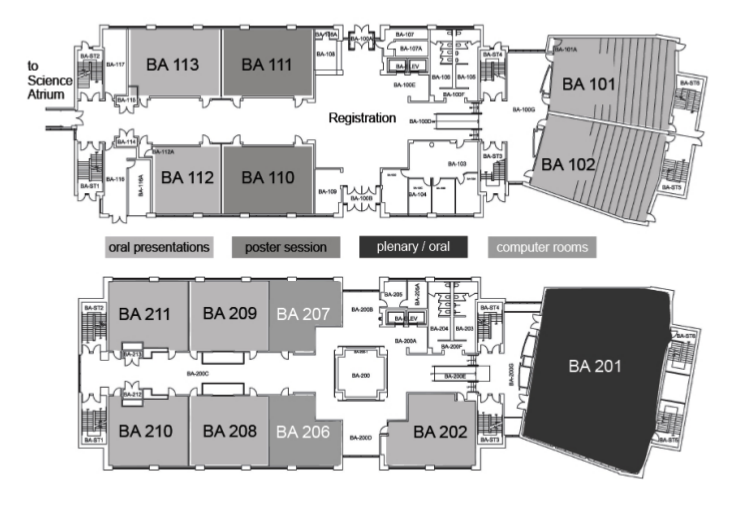 If you require an official document, for funding purposes, stating that you will be travelling to Canada to attend AMMCS-2013, please send the request to ammcs2013@wlu.ca. Please ensure that the aforementioned matters are dealt with as early as possible in order to allow sufficient time for unexpected difficulties or delays.